"The space investment is mobile, liquid, in a way; it can go places, it can be sold if necessary." Tiny houses have evolved from a twee trend into a viable design solution for combatting homelessness, densifying cities, and making vacations more affordable. It’s also creeping into office design, as a new workspace for the tech startup Coroflot shows. 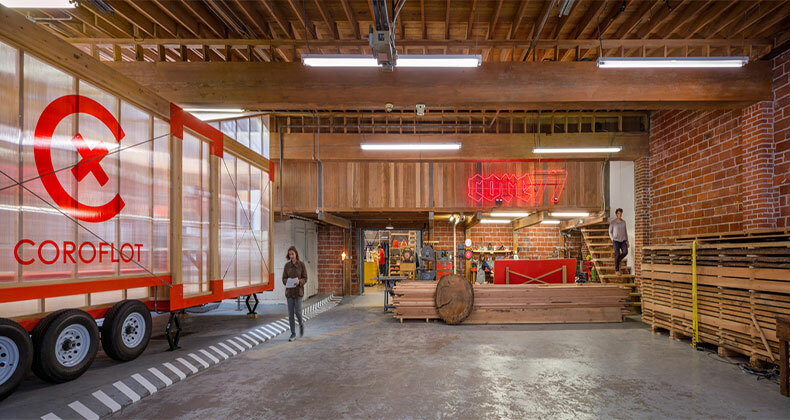 The Portland, Oregon, design studio Los Osos tapped the fad when it set out to build a 280-square-foot office for Coroflot, an online design-services directory and community that was beginning to build out its team. The company didn’t want to shell out for something that it would quickly outgrow; however, it didn’t want to compromise on design in the present, either. Working with a $40,000 budget, Los Osos created a space that clearly communicates Coroflot’s creative vision, can grow with the company, and makes the most of resources at hand—including a mobile office-on-wheels. Coroflot leased a 2,500-square-foot defunct ambulance garage in a low-rent part of Portland, and festooned the exterior in a dazzle-camouflage pattern. The office-on-wheels came from the company’s founder: Back in 2012, Coroflot’s Eric Ludlum had plans to build a tiny house and even commissioned a custom 28′ x 10′ trailer. The project was eventually tabled, but when Coroflot needed space, Ludlum and his wife—Los Osos’s Laurence Sarrazin—immediately thought of the trailer. Its size and mobility (though it’s on wheels, it does take a few days to get it ready to move) made it a perfect fit for the garage space. Sarrazin outfitted the trailer with a Douglass fir post-and-beam frame and polycarbonate walls, which let daylight in while offering privacy and sound insulation. She furnished the interior with a modular office furniture system of her own design. There are workstations, a meeting area equipped with a screen for presentations, and even a little kitchenette. A few plants and cacti add a domestic touch. “It does have a greenhouse vibe and it has been suggested more than once it would make for a great high-end cannabis grow room,” Sarrazin says. While Coroflot’s office was a bespoke project, Sarrazin thinks this model—tiny mobile workspaces—could easily be applied to other start-ups and is especially appealing from a financial standpoint. But it’s not just dollars and cents that make it a smart idea for growing companies.